This is a guest post by Garrett Moon. Garrett is a founder and designer at Todaymade, makers of CoSchedule, a content marketing editorial calendar for WordPress that makes blogging and sharing on social media easier than ever before. How do you find your clients? For many freelancers, word of mouth is king. Meetups, trade shows, networking events, and six degrees of separation are all big drivers for our bottom line. But what about blogging? Have you discovered the secret of using your blog to actually win bigger clients and land more deals? I’ve used blogging to build my client business, and it once netted me an easy $30k sale with almost no work at all. In fact, it worked so well that we eventually built an editorial calendar to help us with the publishing process. The good news is that it’s not all that hard – you can do it, too. One of the common mistakes that I see many freelancers make with their blog is that they spend too much time blogging about the trade that they love, rather than what their clients really want to hear about. While there is nothing inherently wrong with blogging about what you do, how will it help you land more clients? That’s the first big takeaway for understanding how to use your blog to land more clients. The good news is that you can answer these questions in your sleep. Now it’s time to answer them on your blog. The trade-off is simple. When you blog about the things that your customers care about, you provide them with value. Value leads to trust, and that ultimately leads to their business. Your blog can become a client-generating machine if you can figure out what they want to hear and how to say it. Take away: Take a minute and write down the 10 most common questions you hear from your clients. List them in order from easiest to hardest and blog about one or two each week. For years, RSS has been the law of the land for sharing and distributing your blog posts. With Google Reader getting the axe, and RSS never really catching on with the mainstream crowd, things have changed significantly. 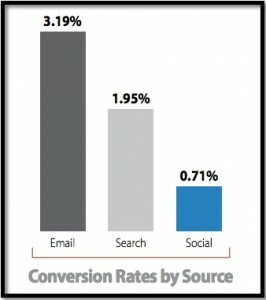 Twitter and other social channels have filled a large gap, but they still don’t match the success rate of email. 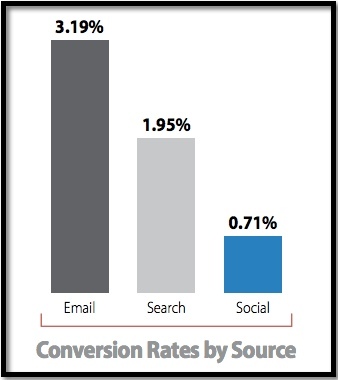 If fact, Monetate’s Ecommerce Quarterly report shows that Email is almost five times more likely to convert to a paying customer than social media. Of course, you hear people say all the time that they don’t like getting email newsletters, but the reality is that most people still subscribe to new lists and read them frequently. Everyone, including your clients, uses email. In just a few years, my own company was able to collect several thousand email leads, whereas we’ve never garnered more than a few hundred RSS followers. Your next task is to capitalize on the “trend” and get your clients into an email marketing list. This will make your blog worthwhile. Take away: Each time you blog, use an RSS-to-email feature to automatically send the ‘entire’ post to your email marketing list. Make it easy for new prospects to get signed up. The number one thing to remember is that you aren’t blogging to make sales. That sounds counterintuitive, but it isn’t. The reason you are blogging is for client trust. As your posts go out, you will continually invest yourself as a subject matter expert in your field. I always like to think in terms of possible headlines. How Photography Impacts Your Website Design. You’ve probably heard that customers buy things from those that they know, like and trust. 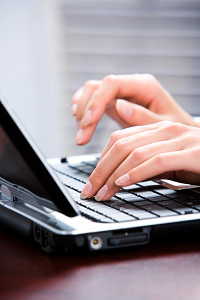 Blogging, with a healthy email marketing component, is a great way to build that trust. When they finally come calling for your services, sales will nearly take care of themselves. Take away: When you write, speak directly to your clients, and earn their trust with your expertise. Every so often, freelancers or small agencies get invited to speak at local events. For me, it was a monthly meeting of local non-profit groups. After my talk, I passed around a signup sheet and asked the attendees to sign up for my email list. Most of them did, and as far as I knew, that was it. Little did I know that several of those non-profits were reading our emails on a regular basis, and sharing them with their entire office. Months after the initial encounter, I received a call out of the blue and had a $30k Christmas present handed to me. It was pretty incredible for several reasons. We have never communicated with this person before. They were a completely new contact. We had to do surprisingly little to sell them our ideas once they finally called. They already trusted us. They had already, and continue to, recommend our work to others. Take away: Look for opportunities to grow your list, and build trust with new audience members. Blogging is a habit, and you are going to have to work at making it one, but I promise that it is a worth-while effort for your business. Here are the practical steps on getting started. Brainstorm some headlines – Start with 20 and grow the list to 100. It is easier to write when you already have the idea. Commit to a schedule – I started with five posts per week, and recommend a minimum of two. Frequency will make you a better blogger. Put it on a calendar – Settle on a few days a week that you will commit to hitting publish. We eventually built an editorial calendar for WordPress to help us keep track of our writing. Commit the time to write – I like to write in the morning before the day begins. You may prefer evenings. Either way, find a time that will allow you to get it done right. Admit that you don’t know what you don’t know – If you wait until everything is just right, you may never start. Get going now with what you have. Focus on your audience, not your bottom line – Blogging is a long-term strategy, not a short-term injection. Don’t get too focused on traffic and phone calls right away. Commit to blogging for at least six months before re-evaluating. No matter what stage your business is in, there is always a good reason to start blogging as a way to grow your client base and improve the size of your sales. As you build value and trust, it will improve everything – even your bottom line.